Thoughts on finances and self reliance from an LDS (Mormon) perspective. In relation to my last post on making sure you always have some sort of job, even if it doesn't match your needs, I figured I ought to point out some of the pitfalls of working in a job that is beneath your abilities. I have a friend who has a pretty bad job, and doesn't get enough hours to support himself. He has mostly quit job-hunting though, because at least he has a job. He's been stuck like this for quite some time. He did the right thing in taking the job, but then he forgot all about finding a better one! Basically, if your job doesn't meet your needs and skills, you ought to be spending serious time job-hunting every week. As a corollary, if you are spending 80 hours a week at this pretty bad job, you aren't going to have the time or energy for real job hunting. Overtime at a bad job will just burn you out, and make you unable to get anything better. Cut back to a reasonable schedule any way you can, just to have the energy to find a better job. I think you should only really quit the job if the only way of keeping the job is working lots of overtime for poor pay, since that means it's interfering with your search for the job you really need. Full-time job hunting can be a depressing, long-term experience. Even if you have to take a job far below your abilities (and perhaps way below your income requirements), you should always make sure you have some sort of job. Then you can spend your spare time looking for the perfect job. You'll avoid gaps in your resume. There may be quick promotion opportunities at the suboptimal job, if you perform well. There are better networking opportunities interacting with people at a bad job than sitting at home sending e-mails. When you take a job beneath your abilities, you really don't need to treat it like a long-term commitment. Don't feel guilty when a better job comes along. Not having even a bad job can easily lead to depression and feelings of worthlessness, which makes it even harder to get a job. It's possible to waste a lot of time on the Internet. Anyone trying to spend all day job hunting on the Internet is going to get bored and start visiting sites of lower and lower quality while surfing. At the end of the day, you'll have done 30 minutes of job hunting and 8 hours of web surfing. You might as well spend those 8 hours doing actual work instead - and getting paid. Remember of course that being unemployed can also be a great time to get additional training - even an additional degree, if you have the means. Here's a bit of money-saving inspiration from "The Simple Dollar:"
This is a fun list. I especially like the items that go "_________ isn't nearly as scary as it sounds." It's so true. A lot of times we spend money to get out of things that really aren't that bad. 1. It's fun to create money strategies and then watch our progress. 2. You realize a lot of things are completely unnecessary after you've put off buying them for a while. 3. Some things cost more to upgrade than others. For example, we could rent a tiny house (here in the bay area), or we could stick with our apartment and stay at the Four Seasons twice a month for the same total cost. 5. Buying things isn't as much fun as doing things. See this post. In this article from the August issue of the Ensign, A. Brent Hammond writes about how he and his wife got through unemployment. Things eventually worked out for them, and they managed to do a lot of good in the process. Do you eat cabbage? We love the stuff. Raw, it's crunchy and a bit peppery. Boiled, it tastes buttery and smooth. And the great thing is, it's super cheap--30 cents a pound the last time I bought some! Cabbage Patch Soup from allrecipes (pictured above). This recipe is easy and tasty. We use real bacon, double the cabbage, and leave out the peas. Chicago Dog Salad from Rachael Ray. It sounds weird, but it's really yummy. We shred the cabbage ourselves; it's easy. 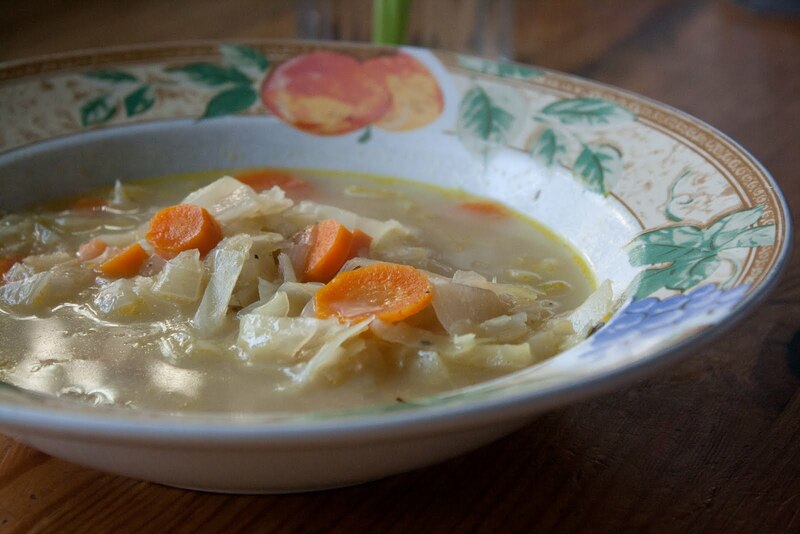 Jeanne's Vegetable-Beef Borscht from the Fix-It and Forget-It Big Cookbook. Borscht is a traditional Russian stew. It is usually made with beets, which turn it bright red. I was excited to find this recipe which is as flavorful as the traditional recipe I use, but much simpler. Preparation still takes some time, but it's worth it! The recipe works best in a 5 quart slow cooker. You could go larger. My alterations and substitutions are in parentheses. Please forgive me if they annoy. 2. Cover. Cook on Low 8-10 hours. (Or on high 2-3 hours, on low 4, if you're a little slow like me). 3. Top individual servings with sour cream. Money does not equal happiness. We know that. However, it turns out, spending money in certain ways can actually make you happier. Think money spent on a family vacation, or saving up for something really special. Here is a great article from the New York Times about Money and Happiness, with some great insights about the kind of spending that adds to our happiness. I particularly liked the description it gives of the"buzz" we get from buying things. We feel great, and then the we get used to whatever it is, and so we buy something else. The Easy Way Out Through Debt Settlement? If you believe the radio advertisements, if you have huge amounts of credit card debt, you can simply make it disappear by calling a debt settlement company. These companies claim to be able to cut your credit card debt by more than half. In the case of two debt settlement companies sued last year by New York State, the attorney general alleged that no more than 1 percent of customers gained the services promised by marketers. A Colorado investigation came to a similar conclusion. The industry’s own figures show that clients typically fail to secure relief. In a survey of its members, the Association of Settlement Companies found that three years after enrolling, only 34 percent of customers had either completed programs or were still saving for settlements. Debt settlement firms have a simple strategy they offer to people. Stop paying money towards credit card bills, and instead send the money to the company. They'll take a huge cut of the money in fees, and after a few years, (if you haven't been sued by the credit card company for failing to pay!) they'll attempt to settle your debts with the credit card company with some of the money you've sent them. The only problem is that it apparently almost never works out. There are much better ways to lower your credit card debts, by working with the credit card companies directly or with some of the reputable companies that partner with them. CreditCard.com has an article about the best steps to take when overwhelmed by credit card debt (and includes yet another warning not to use debt settlement firms) at Credit card debt negotiation in 3 (not) easy steps. Nicholas Kristof has written an article about his experiences talking to some incredibly poor people in the Congo Republic. In his article Moonshine or the Kids he makes a similar point to what I wrote a while ago in Priorities, where I describe a poor Armenian man who said his top priorities were his family and his health, but spent huge sums of money on liquor and cigarettes. 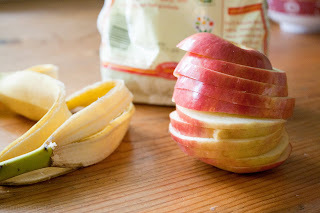 A while back, I wrote about food waste and how much of my kids' food ends up on the floor. It's something I'm working on, and so I appreciated finding this post from WiseBread with ten good tips on how to keep calories out of the trash. Thanks to Cheap, Healthy, Good for the link. J.D. Roth at Get Rich Slowly wrote a post this week about a little clothing experiment he did over the past year. How many of his clothes did he actually wear? 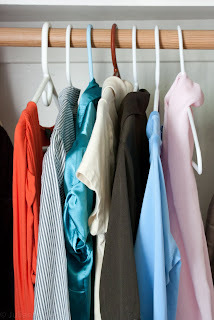 Take a look, and think about your own closet. Thanks to Cheap, Healthy, Good for pointing this one out. 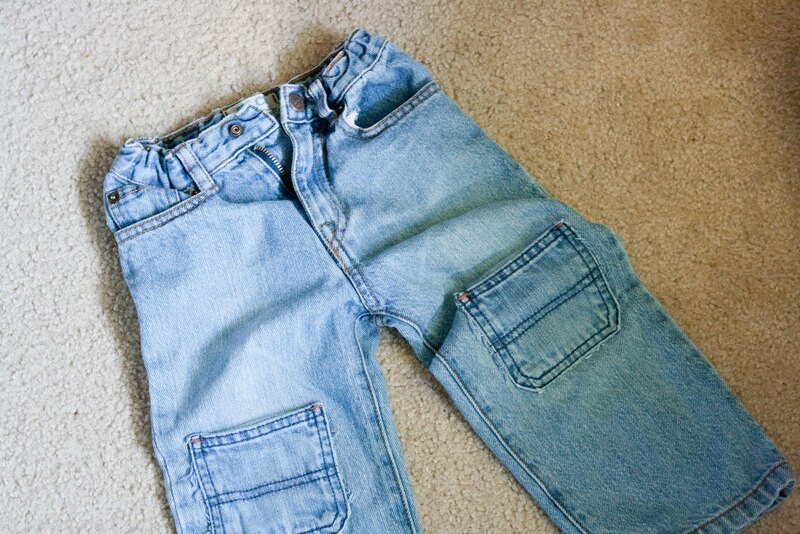 A couple of weeks ago, I finally got sick of the pile of little boys' jeans on my sewing table. I was not feeling terribly ambitious, and so I came up with a lazy way to patch them. I like the results. Here is what I did. I took the jeans that were especially worn out and I cut out the back pockets (so I had two layers of fabric, and one layer had raw edges). Then I found jeans of a similar wash, pinned the cut-out pockets over the holes in the knees and sewed around the outside edge on my sewing machine. It takes some careful arranging to get them on the machine so you can sew through the right layers, but it's do-able. The bottom layer of the patch frays a little around the edges, which gives it a slightly distressed look without being sloppy. One of the byproducts of engine combustion is water. When an engine reaches its operating temperature that water turns to vapor and is expunged, either out the tailpipe or the crankcase ventilation system. On a short trip, however, that water stays inside your car's engine and exhaust. Unfortunately, water is one of only three ingredients necessary to make rust (you've already got the other two, oxygen and metal), and rust kills ... A further complication of condensation and water is that it dilutes your oil, which then does a poorer job of lubricating the engine. If you can't avoid taking lots of short trips, we recommend you change your oil frequently, such as every 2,000-3,000 miles. Cutting back on the clothing budget can be really hard. Somehow it feels more personal than other things. But, it is often necessary, and it can make a huge difference in our overall spending. Here are a few strategies to help. Choose the ones that work for you. 1. Keep careful track of how much you spend on clothes each month. Sometimes just seeing the numbers will help you come back to reality. 2. Learn to be thrifty. Check out this article from the April Ensign. Jane McBride Choate gives great practical advice for getting everyone dressed while staying on budget. 3. Make some new rules. If you are too often finding items that are irresistible, maybe it's time to set some guidelines. The easiest rule to make this: if you don't have money left in the clothing budget you can't buy it, no matter how cute it is. You can add in some more creative rules, though. Use your imagination. My cousin-in-law used to keep herself in check by selecting one color every year. If an item wasn't available in that color, she couldn't buy it. My mom's strategy was to make me think about it for a while. If it's still irresistible tomorrow, you can always come back. Or try this: you can't buy anything new until you've worn everything in your closet at least twice! 4. Buy clothes that fit and flatter. Usually when I throw clothes out without wearing them much, it is because they never quite fit right or they emphasize my figure in awkward ways. It doesn't matter how trendy it is; only buy if it looks great on you. 5. Speaking of trends... If you don't love it, skip it. 6. Shop with cash. Somehow money is more real when you hold it in your hands. A few months ago, Jeremy and I gave each other a sorely needed clothing bonus-- in cash. It was great. I always knew how much money I had left, and I managed to make it last. 7. Learn to love the thrift store. With a little patience you can find some great stuff here (I promise). You may not find it this time, though... Thrift stores also offer a dose of perspective: You can see what things look like after they have been washed a few times. And you won't be overcome by the chic atmosphere. It's all about you and the clothes. Do they fit right? Do you enjoy wearing them? Okay. 8. Avoid marital tension. At our house, we do this by making clothing come out of our personal allowance. Electronics also come out of our allowance. I buy clothes; Jeremy buys computers. All is budgetary bliss. 9. Don't shop for recreation. (This bit of advice comes from my family finance professor, Alena Johnson ). If you have enough clothes, and you're bored, you can always make someone cookies. 10. Be you. Remember that old Mormonad? "Be you're own kind of beautiful." If not, here's a link. We really can't be everything. Enjoy the beauty and talents of others; be beautiful and talented yourself; but don't be the same. Our church has created a new website with a variety of resources to help those looking for work. It is free and open to everyone. Visit www.ldsjobs.org. We had one of those great talks during Ward Conference that made us feel guilty - the speaker strongly recommended buying a home over renting an apartment. This surprised us, since pricing in our area means that renting usually makes more sense financially. There are certainly other benefits to owning a home though, and I think it's a good goal for any family. At the blog "The Simple Dollar", there's an article up talking about four things to DO while preparing to buy a home. The suggestions are great - and ought to help anyone to make sure they are prepared to buy a house, and know that they can afford the house they will buy. I told you I'd get back to you about Cheap, Healthy, Good. The verdict? Great recipes. Useful tips like the top ten cheap & healthy foods. Recipes are simple and straightforward. Leans towards vegetarian, but there are recipes with meat as well. Plenty of blog-style fluffy entertainment (usually I just skip to the recipes). Check it out. 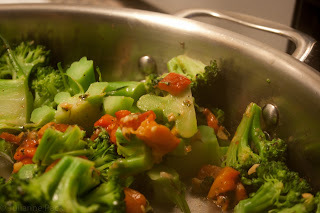 The above picture is of Broccoli with Roasted Red Peppers. Among those criteria are that the internship should be similar to the training given in a vocational school or academic institution, that the intern does not displace regular paid workers and that the employer “derives no immediate advantage” from the intern’s activities — in other words, it’s largely a benevolent contribution to the intern. If your unpaid internship involves making copies and addressing envelopes in exchange for nothing but course credit (and perhaps the dangling carrot of a possible future position), there's a good chance it's illegal. 4 That they should let no pride nor haughtiness disturb their peace; that every man should esteem his neighbor as himself, laboring with their own hands for their support. There is a post on The Simple Dollar describing how much work it can require to "beat the market" while investing: Investing and the Time You Have. I don't want to spend that much time just deciding how to move my money around. That's why I stick with low-cost, low-maintenance index funds. It gives me more time for things that are more fun and important, like my family, work, community and church activities, and my part-time degree. As a child of God, our deepest hunger and what we should be seeking for is what the Lord alone can provide-- His love, His sense of worth, His security, His confidence, His hope in the future. Here is the latest "Mormon Messages" video from our church. Elder Hales explains beautifully how we can live within our means and live well. I just read a great post titled The Balance Between Splurger and Miser. It's from one of our favorite sites, Get Rich Slowly. 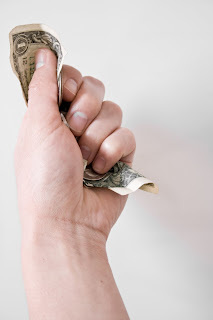 April Dykman writes about how she has struggled with money, first spending money she didn't have, and then later almost refusing to spend at all, even though she had money to spare. Now she's finding a happy medium. Everyone should read it. At the end of her post, she makes a list of things that are important to her, things that are worth a little extra. My list would include eating healthy food, having supplies to build and create, helping people, and visiting family, among others. What would you include? Does your spending reflect the things that are most important to you? When I was in college, someone told me that rice freezes beautifully, and that it doesn't go dry and stale nearly as fast as refrigerated rice. I wish I could thank her a hundred times! Rice was one of the staples that helped us survive working/teaching/studying/pregnancy the first couple years of our marriage. I would cook up a big pot of rice for dinner and freeze the extra in individual portions. Then we could take it with us whenever we had access to a microwave. Now, my kids love rice. I mean, really love it. 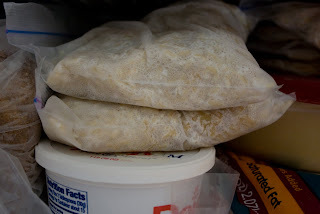 Cooking brown rice takes an hour, but I freeze it in bags so we can eat it whenever we want. To reheat, I open the bag partway and microwave as is. For bigger bags, I stir the rice halfway through cooking time. Don't overheat! The bag can melt. 1. Start with cooked rice that isn't too wet or dry. Rice that is wet can take on a funny texture when frozen. 2. Add a little oil sometime during or after cooking. This also enhances texture. 3. If you find your rice is coming out of the microwave a little dry, just sprinkle a small amount of water on it before reheating. 4. For rice on the go, sprinkle seasoning on individual portion bags of frozen rice and take them with you. We love lemon pepper or seasoning salt on rice. Q: You have $25 to feed yourself for a full week. You’re starting from scratch, with nothing in your pantry, freezer, or refrigerator. What do you purchase? 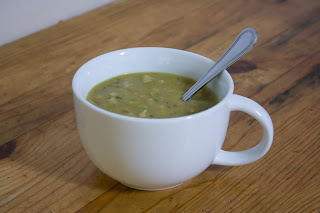 That is the question posed (and answered) on the latest post from food blog Cheap, Healthy, Good. I just found this site based on a recommendation from Lifehacker. I like their philosophy, and I'm excited to explore some more. I'll let you know how it goes. Okay, it's time for a confession. I am currently $64 over on my allowance. I am in debt to my own budget. Ick. The good news is, I'm making progress. I have been trying to dig myself out since January, when it was much worse (and the allowance debt rolls over every month, no freebies). I'm going to make it out, though. I am determined. No new German bakeware this month :-). Julianne and I have it pretty easy, we agree on almost all of our expenses, and the rest are small enough to fit into our personal allowances (see Giving Yourself an Allowance). I know people who aren't so fortunate - who have large expenses that they can't agree on. When one spouse wants to make a large purchase that the other spouse does not support, this can result in major conflict - whether or not the money is spent. It can bring on feelings of martyrdom or of not being supported. The battleground over expenses can then quickly expand. Here's an article discussing the importance of having similar financial goals, and ways to work out our differences when we don't: The Key to Wedded Bliss? Money Matters. One piece of advice that struck me as especially useful was to seek the help of mediators when necessary. And really, divorce is expensive, much more expensive than foregoing a few things you want, and letting your spouse get a few things you may think are unnecessary. Families are more important than finances, and letting money tear a marriage apart is foolish. Last night we ate Potatoes, Carrots, and Onions for dinner. This dish is thoroughly unglamorous, the ingredients are simple, and we love to eat it. Add a side of beans or meat for protein. Wash the potatoes; peel the carrots. Chop the onion. Put water on the stove to boil, enough to cover the potatoes and carrots. While you wait for the water to boil, heat about a teaspoon of the oil in a skillet or frying pan over medium heat, add the onion and cook, stirring frequently, until the onion is tender and translucent. 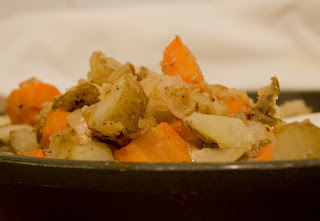 Cut the potatoes and carrots into half-inch chunks. When the water starts to boil, add the potatoes and carrots, boil about 9 minutes, or until the potatoes are just barely as soft as you like them. Drain the potatoes and carrots. Add the rest of the oil to the frying pan, then add the potatoes and carrots. Turn the heat up to medium-high. Cook a few minutes more, stirring continuously, adding salt and pepper to taste, until the potatoes and carrots are brown around the edges. Kids get bored with toys they see all of the time. 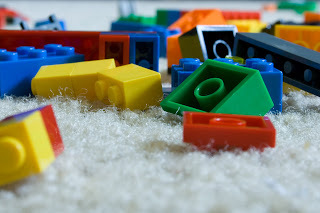 For our kids (a preschooler and a toddler), that means they pull out all of the Legos, spread them across the floor, and then go get more toys. Very little playing goes on for the amount of mess they make. Luckily, we found a pretty decent solution. And we didn't have to buy them more toys! My friend April introduced us to the concept of toy cycling. At their house, they go through toys every few months and put some of them in storage. Then, when they pull them out to put different toys in storage, the old toys are new and exciting. At our house we do our own variation of toy cycling. We decided to put all of the toy sets with small pieces up high in the closet. The kids can play with whatever they want, but only one at a time. If they want a different toy set, they need to put away with the one they are already playing with. This has done wonders for the mess level in our apartment, but it has also improved the way our kids play. Suddenly, they play with toys longer and more creatively. They like and care about their toys more. This is the solution we were looking for. A bunch of new laws are going into effect to try to regulate bank fees. One of the most important of these is requiring that people opt in to "overdraft protection." Overdraft protection is where the bank will kindly let you put charges on your debit card even when you don't have any money in your account. They then charge a very large fee for the "privilege." Banks point to the fact that you may need cash during an emergency, but I doubt that the $40 billion dollars a year they make from overdraft fees are all because of emergencies. Without overdraft protection, your card will just be declined if you don't have cash left (which makes sense). Starting now, banks will be required to receive permission to allow overdraft protection for debit cards. Since this is a major source of revenue, they are likely to start sending lots of advertisements attempting to convince people to get this protection. I highly recommend ignoring the ads. Who is Responsible for the Family Budget? In the family where I grew up, my father did the finances. In Jeremy's family, his mother did them. So, naturally, when we got married each of us hoped the other would do them. It took us a long time to figure out who would be responsible for our money. In the meantime, we had a budget, but we didn't follow it well or keep detailed records. Bills got paid on time, usually, but we spent more and saved less than we should have. 1. Jeremy set up budgeting software and makes sure it is working correctly. 2. I go through our expenses every week online and label them with the proper budget category. 3. Jeremy pays online bills. 4. I pay bills that require writing a check. 5. Together, we discuss the budget and make changes as needed. 7. I deposit most checks. 8. Jeremy manages our investments and keeps me informed. 9. Both of us are responsible for staying within budget. "Managing Resources Wisely and Staying Out of Debt." Each of the church leaders quoted in the message talks about skills we need to take care of our families and avoid debt, among these are cooking, learning "emotional resiliency," saving money, and having faith. My cousin (who is a lot smarter than me) once told me that she used to think she would not have to budget as long as she didn't spend very much. She had since discovered that a budget was a necessity. It took me a few years to figure out she was right. Why doesn't the try-not-to-spend-too-much method work? I think there are a couple of reasons. First, without a budget we have no reason to prioritize. It is easier for us to justify purchases as something we need or deserve, and we have nothing to curtail us but a vague sense that we have spent too much. Second, we forget. I never feel like I have spent much, but the record we keep of our expenses tells me otherwise. It's a good reminder to count the extras I have and be grateful. I love it when I find out I can replace an expensive ingredient with something more practical. 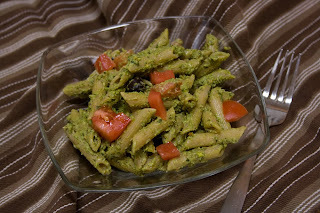 We just tried out a this recipe for pesto, which calls for pistachios ($4 a pound) instead of pine nuts ($20 a pound). It was delicious. Life is good. Feel free to leave out the Kalamata olives if you don't like them or don't feel like buying some. You can also replace part of the olive oil with water to make a reduced fat version. God sent us to Earth to learn things we could not in His presence. To put it simply, we are here to grow up. This idea has been on my mind a lot lately. I am glad I don't have to have everything figured out yet, but I know I need to keep working on it my whole life. The February issue of the Ensign has two separate articles about growing up. The first, "Grow Up unto the Lord" focuses on spiritual things. The second, "That They May Grow Up in Thee" is about the practical skills we need as adults. We are in charge of our own lives, and that is both thrilling and intimidating. I know I'll need the Lord's help. Go to the Movies Instead? 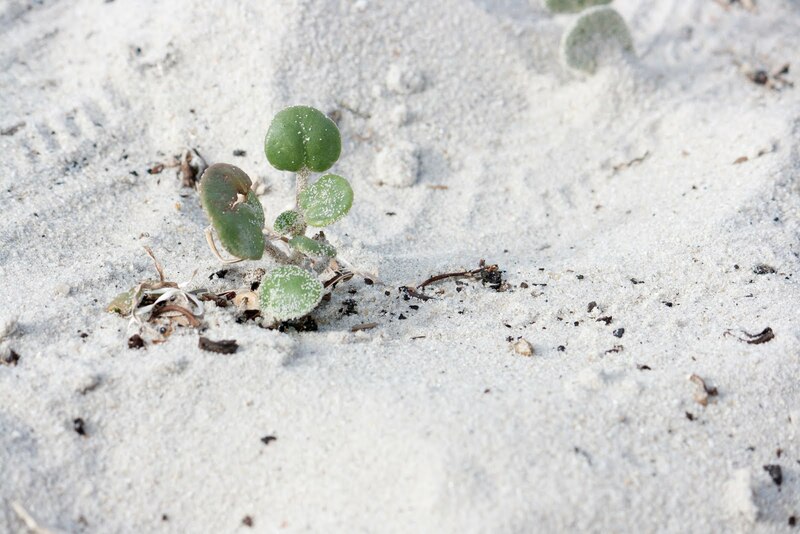 What Does It Mean to Be Self-Reliant? This blog focuses most on managing your money wisely, but there is a lot more to being self-reliant than just spending less than you earn. My friend Molly writes a great summary of self-reliance in the latest post to her blog Naturally Molly. Looking back over my posts about grocery buying, I realize some of it sounds a little extreme. Budgeting should not stress you out. If you hate cooking, it probably isn't worth it to make everything from scratch. Use the step-down method! (See my original post about it. I love this.) You don't have to go from buying all the finest groceries to all the cheapest. 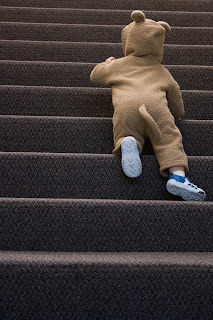 You just have to take a few steps down, and keep doing it until you are within budget. What do you really care about? Prioritize. If you love gourmet butter, buy it. But that might mean you need to buy store-brand on a few other items. Keep the things you really want, and step down on the things that don't make as much difference. You'll hardly notice (but your budget will). Improve your plan. Have to have deluxe frozen pizza? You could decide to buy only when it's half price. Or you could start buying it half as often. That counts as stepping down too. See, we really don't have to do everything. Life is good. One thing that I discovered the last time I was unemployed for a significant time (which was thankfully quite a while ago) was that I spent more money while unemployed then I had before! Looking back on it, it still doesn't make much sense to me. This article details the experiences of various people who lost very well-paying jobs, but did not immediately adjust their standard of living to compensate. Losing a job should require serious "stepping down" in each area of your expenses. One women was sending out ten resumes a day through Monster.com. Another fellow figured he'd sent out 3000 copies total. 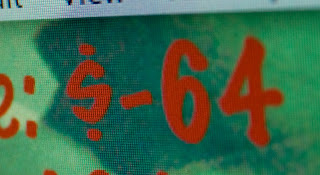 Though it is a useful website, it's possible to send out a lot of resumes with poor results. Without networking and a good resume, you can easily send out hundreds of ignored resumes. If you've saved enough before losing a job, it can actually be a great time to work on your education, giving you a chance to get a better job than the one you lost. Identify and track your expenses, so that you know what to cut to make the biggest difference. Try not to worry about what neighbors or family will think when you are cutting back. Trying to "keep up with the Joneses" is foolish enough when you actually have a job.